The Portobello Road Market—a six-day street market in Notting Hill, London—is one of the most famous street markets in the world. People flock to the Saturday antique market, in particular, to peruse over 1,000 antique vendors selling anything from furniture to collectibles. The narrow Portobello Road stretches over two miles and is lined with well-established independent boutiques. Visit the antique stalls on Saturday, allow the kids to pop into a host of arcades, stroll through galleries, and then dine at the cafés that line the streetside. 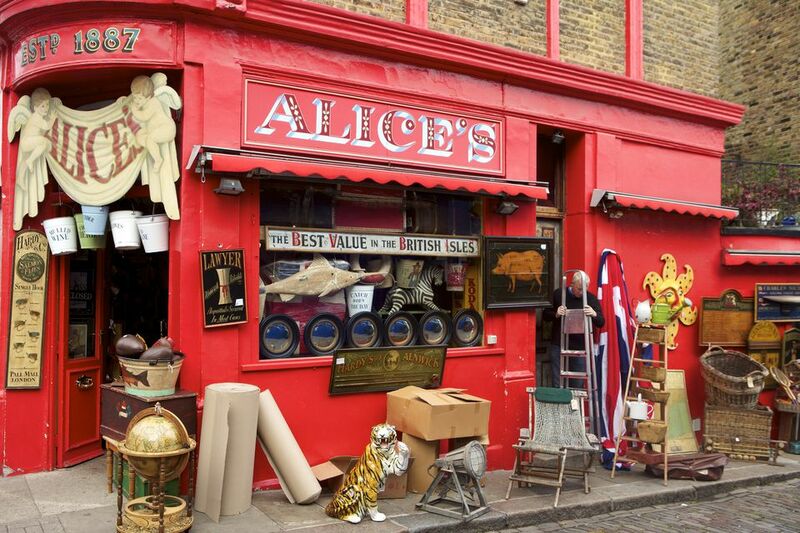 At the top of Portobello Road, near the Notting Hill tube station, lies the famous antique market. Walk past wonderful Mews houses until you reach the junction of Chepstow Villas and Portobello Road. This is where the antique section and the half-mile sale to Elgin Crescent begins. Expect to see a variety of antiques and collectibles from all around the world and dating from Roman times to the 1960s. With hundreds of market stalls, shops, arcades, and cafés, you could easily spend hours here—or make it a day. Continue down Portobello Road (it's actually a hill) to the fruit and vegetable market. The scene here likens itself to a traditional stateside farmer's market and mostly serves the local community looking for fresh produce. However, tourists can stop in and sample fresh fruit for a picnic lunch or buy a bag of vegetables to cook later at your rental flat. Bread stalls, fishmongers, and cheese stalls selling artisanal goods and specialty items round out the foodie experience at Talbot Road and Portobello Road. Under the Westway (an elevated section of highway), you'll find secondhand clothing, jewelry, books, and music. While this section of the market seems a little seedy, don't worry, it's safe and worth checking out if you like a bargain. On Friday, stalls sell vintage clothing and homewares. Saturday is reserved for junior designer clothing and handmade crafts. On Sunday, head down to the Westway for a traditional flea market. This is the only section of the market open on Sundays, aside from the shops and food purveyors along the street. The Portobello Antiques Dealers Association (founded over 20 years ago) promotes the antique shopping area of Portobello Road and Westbourne Grove and ensures fair trading between its members and the public. All traders follow a code of conduct when describing goods and displaying their price. If a price is not displayed, ask to see the price guide to be sure you're charged the same price as everyone else. Traders are open to bargaining, but be respectful. And for a confident buy, look for vendors displaying the PADA symbol on shops and market stalls. The Portobello market is open from 8:00 a.m. to 6:30 p.m., Monday through Saturday. (Times can vary depending on the weather, as stallholders pack up early on rain days.) And while the official guide says the Saturday market can open as early as 5.30 a.m., in reality, it doesn't. Plan to have breakfast in the area just prior to the true 8:00 a.m. opening, so you're ready to start browsing stalls before a crowd forms around 11:30 a.m. The antique market officially closes at 5:00 p.m. on Saturdays, but expect market stallholders to pack up around 4:00 p.m. And the market is closed on UK bank holidays, Christmas Day, and Boxing Day. There is limited parking in the area so plan to use public transportation. The Journey Planner will help prepare your route. The Westway area under the highway can be cold, even on a sunny day, so pack a sweater if you plan on hitting the bargain basement. And note that bags, valuables, and crowds attract pickpockets to this event. Make sure you can see your bags at all times and don't leave your shopping unattended at a café.